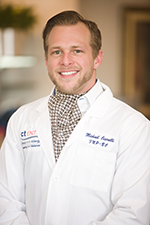 Michael Cicirelli is a certified Advanced Practice Nurse who has been a member of the CT ENT Sinus Center Team since 2015. Mr. Cicirelli graduated from Fairfield University in 2011 with a Bachelors in Nursing, and joined the Yale New Haven hospital nursing transplant team. He then became an Assistant Patient Care Manager at Norwalk Hospital. During this time, he obtained his Master’s degree in Nursing, becoming board certified through the ANCC as a Family Nurse Practitioner in 2015. Mr. Cicirelli also serviced as clinical research coordinator on a sinus implant study titled NOVA, and is currently working on a study known as OFESS with CT ENT Sinus Center Director, Dr. Robert Weiss..
Michael Cicirelli has experience in treating patients at all stages of life and enjoys working to establish a beneficial relationship with the families and patients he serves.